anneliese kliewer: first week of school! Well, I made it through the first week of school! We have 20 students in our class (we had 21, but one already dropped out---to another school). My cooperating teacher is just wonderful! She is so sweet & smiley…but really brings the hammer down when needed. I think that she is going to be a wonderful example to learn from. I am really excited! In my student teaching journal I have created a section “things to note” here are a few tidbits. I think that I will find the most blog worthy material in this section. So I will be using it from time to time. - -I have cute new shoes from target. I also have new (not so cute) blisters covering my feet. ß this actually turned out to be an exaggeration, I only have one blister on my heel. 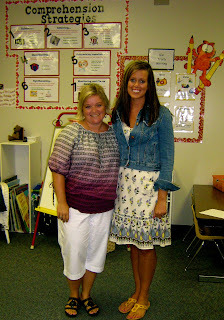 - -2nd grade teachers only drink diet mtn. dew. I'm so excited for you! I always wish that I had gone into teaching. And I love your observation that "2nd grade teachers only drink diet mountain dew" -- so funny. anneliese! oh my goodness. i didn't even know that you had a blog until just now! what the world?! anyway, i'm super excited about this. congrats on having the first week of school under your belt. woohoo! ps. i saw your comment on my last post and just wanted to clarify that green works is the stuff that does NOT smell good! nature's source is the orangey-good stuff. i would feel so bad if you got stuck with the yucky stuff. that is a big class. (or...it seems like a lot of kids to me.) You look like a darling teacher. i am sure they love you.